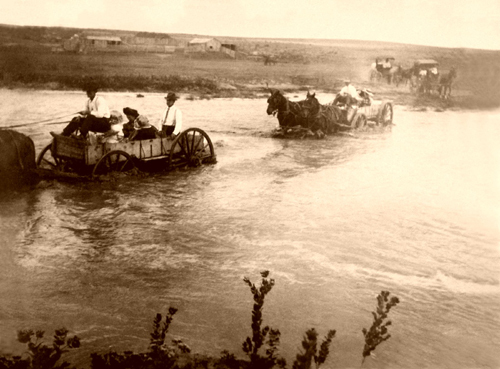 While crossing the Cimarron River, the team balked and started settling in some quick sand. Grandpa's brother, Uncle Albert, who had come along on the trip to help out, saved the day. He jumped into the river with a terrible splash shouting and splashing water at the team with both hands. The startled team, not wanting to have anything to do with Uncle Albert, soon had the wagon high and dry on the Guthrie side. Dad spent nearly forty years in Guthrie watching the town grow. He met mom in 1910 at the one room Prairie Grove School, when she was 12 years old. Mom and her family moved to California in 1920. They stayed in touch by mail. Mom was pretty much an old maid and Dad a successful bachelor and kind of a hermit when they got together more than ten years later. Mom found out that Dad might be getting interested in someone else. She panicked and headed for Guthrie in her old Dodge; her brother, John, came along as chaperone and co-pilot. They decided to get married but Dad got cold feet and tried to back out of the deal on the courthouse steps. Uncle John said he grabbed him just in time before he got away and was able to convince him of the benefits of married life or I wouldn't be telling this story. I left Oklahoma too young to get to know my Grandpa Hockaday. Dad eventually lost the two houses he owned in Guthrie and his Dad's farm mostly because of the move to California at the height of the Depression. After living in California for ten years Mom hated Oklahoma. Dad said when we got to California he had only 50 cents in his pocket and had to start over. We lived an old one-room shack in the orchard behind Grandma and Grandpa Loofborrow's place in Pomona for nearly ten years. I got to know the Loofborrow clan real well. We’ll get started by going back to Oklahoma. This is my Mom’s side of the family, the Loofburrow clan on their Oklahoma farm in 1904 back when horses and mules were doing most of the pulling. In 1920, Grandpa sold the farm, loaded grandma and their 7 ½ kids into two Model T Fords and headed for California camping at night along side the road or in city parks. Uncle John said the road that crossed the desert was just two ruts in the sand but when they got to the paved road at the summit of Cajon Pass, Grandma thought they’d finally got to California. When they got to Pomona they camped in Ganisha Park for a week while Grandpa looked for some land with a house on it. He bought 3 acres and a house at 1408 West Grand. Besides his family, Grandpa Loofbourrow loved to work, garden, go fishing, smoke his pipe and have a good laugh. His favorite song was, "Under the Double Eagle". Because he saw me get my tricycle stuck in a big mud puddle once, he named me 'Stick-in-the-mud'. He showed me how to catch gophers and paid me 5 cents for each tail. He sometimes rented one of Jobs' mules to help with the work around the place. One day I got a demonstration. He named the various parts of the harness and showed me how to put them on the mule and hook him to the plow. While plowing he could drive the mule with the lines wrapped around him, one under his right arm and the other over his left shoulder and guide the plow with one hand while he thumbed the loose tobacco in his coat pocket into his pipe with the other. Then he lit it with one of those old wood matches all in one continuous motion without even slowing down. One time when a car that wouldn't run blocked part of the driveway for three or four days, Grandpa got tired of it and hooked the mule to it and towed it away around back. Once when I accidentally broke one of his windows with my slingshot he charged me $2.50, gave me some work to earn the money then made me stand there and help him fix it. I don't remember him ever having any teeth; he chewed his steak on the plate with his pocket knife. Split the kernels on an ear of corn with his knife so he could gum it off the cob. I think he only shaved once a year, he didn't look like my Grandpa until it grew back. He loaned me $35 to buy my first car. I only have seen him wear his false teeth twice, once for their 50th wedding photo and when they buried him. There is a lot more but there probably isn't enough room for it here so I left a lot of stories out.